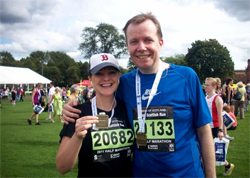 Congratulations to Jason and Lynn Leitch on successfully completing the Great Scottish Run on Sunday 4 September. Jason managed to cover the 13 mile distance in 2:07, with Lynn following him home in 2:11. A group from the YF also went along to cheer them on, flags and all. So far they have managed to raise over £3500 for IREF. If you would like to donate to this worthy cause, follow the instructions below.